Illinois Republicans Promise To Block Gov. Quinn's "Insatiable Appetite For More Spending"
GOP lawmakers in Illinois are warning the governor that they will block any efforts to borrow more money to pay the state’s old bills.Democratic Gov. Pat Quinn is expected to propose an $8.75 billion borrowing plan when he unveils his budget today, the Chicago Tribune reports. The money would be used to make overdue payments to vendors. 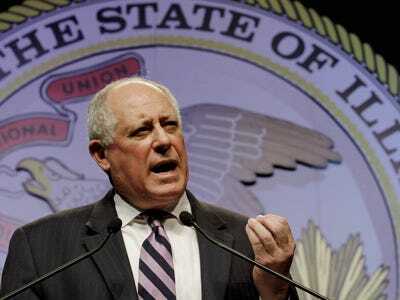 The Trib echoes GOP criticisms in an editorial, calling Quinn’s borrowing proposal “dangerous and unnecessary.” Quinn’s budget plan is expected to increase spending by more than $1.4 billion. The new borrowing would be in addition to the state’s $3.7 billion bond issue, originally scheduled for this week. The sale was postponed to give investors time to consider Quinn’s budget proposal.